Nine days earlier on December 2nd, two million people flooded Tehran’s Shahyad Square calling for the overthrow of Shah Mohammed Reza Pahlavi and the return of Khomeini. By the day of Ashura1978, two million people had grown to nearly nine million. About 10% of Iran’s population now demanded the Shah step down. Though this turning point was not unexpected, we lived without access to the news. Three months earlier on what became known as ‘Black Friday’ (September 8th), ninety people had been shot to death and over 200 injured when the Shah’s soldiers opened fire on protesters in Tehran’s Jaleh Square. A month earlier on August 12th, martial law had been declared in Isfahan when protesters set fires and attacked the Shah Abbas Hotel. A week later 470 Iranians were burnt to death when the Cinema Rex in Abadan was set ablaze. The Shah and SAVAK, the secret police, were blamed. In truth, this horrifying arson terrorist attack was plotted by revolutionaries to create a tragedy and blame it on the Shah. It took twenty-three years for the truth to come out that anti-Shah revolutionaries barred the entrance doors of Abadan’s Cinema Rex and strategically placed flammable materials inside and around the building before setting it alight. They set fires on all four sides of the building to prevent rescue attempts. The fire had been the work of four Islamic activists who had carried out the deadly mission as part of their allegiance to Khomeini and his Islamic Revolution. Only one arsonist survived the fire and remained in hiding until he could stand his anonymity no more. He confessed to the crime because he could no longer sit and watch someone else receive the credit for what he saw as the ultimate act of sacrifice for the Islamic Revolution. Meanwhile, our life in Isfahan went on peacefully as we were pretty much oblivious to events as they unfolded. The only TV we had was the government channel that broadcast mostly nature films. We occasionally got news through the radio on BBC world news if weather conditions were right. Otherwise, we relied on expat community rumors for our news. Surprisingly, those of us who lived in the Jolfa district of Isfahan were not affected by events. Our work with Bell Helicopter training pilots was periodically interrupted but, on those days, we went to work, we were ‘briefed’ on developments, as best Bell Helicopter knew. For Thanksgiving, Bell Helicopter traditionally gave out turkeys and peanut butter. I remember going to the American School to pick up our turkey. Streets were pretty much empty we seemed to be the only ones at the Bell Compound. An Iranian rug merchant had driven down from Ferdowsi Street in Tehran to sell carpets that day. My wife and I looked through his carpets. He insisted we pick out our favorites. So, we did. Then he asked how much we would pay for them. Off the top of my head, I offered an insultingly low-ball price. To my surprise, he accepted it. So, I said, “Will you take a check?” He agreed so off I went in a cab to pick up my checkbook. When I returned, he grabbed me, took me aside and made me swear that I would not let anyone know the prices I paid. The sun had come out, and there were lots of expats picking up their turkeys and looking at carpets. Soon rioting spread to the bazaar district of Isfahan and fellow workers in that area had fled their apartments and came to live with us in the Jolfa District. Jolfa is one of the oldest Armenian quarters in the world and was established in Isfahan in 1606 by Shah Abbas to resettle the thousands of Armenians fleeing the Ottoman War of 1603. Armenians are Christian. The Vank Cathedral in Jolfa has existed since 1606 and is the cultural heart of Jolfa. In Jolfa, one could purchase wine, liquor, and freshly baked pastries. One of the saddest memories I have of my time in Iran is a bombing in Jolfa. On Christmas Eve 1978, Mr. Armeni was saying goodnight to his daughter when a pipe bomb was lobbed into her bedroom. The blast killed them both. Mr. Armeni was a leader of the Armenian community and owned the Armeni Store in Jolfa. Pipe bombings became a real threat as the revolution gained momentum in Isfahan and Captain Jack, the upstairs neighbor of our good friends in Isfahan, always carried a loaded 45 with him, as a result. By now, we lived collectively and shared meals. Needless to say, we had a lot of turkey to eat. Though Captain Jack had departed early, he had stocked up on wine and vodka, so our little group was well lubricated. Unfortunately, the smokers in the group had stocked up on cigarettes, and it didn’t matter if you smoked or not, just by being in the room, you smoked. The new year approached. As a last-ditch effort the Shah to appointed Shahpour Bakhtiar of the National Front to form a government on December 29th. The new year comes, and in Paris, Khomeini announces the formation of a revolutionary council to prepare for an Islamic Republic. On January 16th, 1979, the Shah departs Iran and on February 1st, 1979 Khomeini returns. We watched his return on TV. By this time, an evacuation was on everyone’s mind. Bell Helicopter now held periodic briefings at the Kourosh Hotel a few blocks from where we lived. Many expats had already left Isfahan. Our contract was under the Department of Defense and until they declared “condition red,” we would not be reimbursed for our losses. I our case the loses would be considerable. We lived in the local community. We were not provided with “company housing,” and we had to completely furnish our apartment. Which we did at considerable expense. Our landlord was a ‘bazaari’ (member of the Isfahan Bazar) and ran a samovar shop. We lived above he and his family. He was most apologetic about the revolution as it was bad for his business. His daughter, however, wore black chador and supported the revolution. In preparation for evacuation when it came, we began trying to sell everything we could. Rather, we began to barter everything we could. Mostly we bartered our TV and furniture for Persian carpets. Regular Bell Helicopter employees were asked to take things they wanted to be shipped out of Iran to the American School. As subcontractors, we were on our own. So, my wife and I packed the carpets we had bought or bartered for into two trunks and awaited word to evacuate. Then word came down that we were being relocated to Sharhin Shar, an Iranian Airforce Base north of Isfahan under the control of the Islamic Guard. Ashura in Arabic means the 10th day- the 10th day of Muharamm (مُحَرَّم‎), the first month in the Islamic Calendar. Muḥarram ( مُحَرَّم‎) is one of the four sacred months of the year during which warfare is forbidden and is held to be the second holiest month, after Ramadan. Because the Islamic calendar is a lunar calendar, Muharram moves from year to year in comparison to the Gregorian Calendar. The tenth day of Muharram is known as the Day of Ashura, part of the Mourning of Muharram for Shia Muslims and a day of fasting for Sunni Muslims. The practice of fasting during Ashura stems from the hadith in honor of the story of Musa (Moses) and the victory his people obtained a victory over the Egyptian Pharaoh on the 10th day of Muharram. Accordingly, the Prophet Muhammad asked Muslims to fast on this day and on the day prior. Conversely, Shia Muslims mourn the death of Husayn ibn ‘Alī and his family in 680. As martyrs, Husayn and his family are honored through prayer and abstinence from joyous events. Shia Muslims do not fast on the 10th of Muharram, but some will not eat or drink until the afternoon to show their sympathy with Husayn. Most of the Prophet Muhammad’s followers wanted the community of Muslims to determine who would succeed him. A smaller group thought that someone from his family should take up his mantle. They favored Ali, who was married to Muhammad’s daughter, Fatimah. Forty years ago this week, a Pan Am 747, staffed by an all-volunteer crew, landed in Tehran to evacuate us to Frankfurt, Germany. Though Khomeini guaranteed safe passage for foreigners wanting to leave Iran, all regularly scheduled flights in and out of Iran had been canceled. Fortunately, Pan Am and their voluntary crew risked flying into the heart of a Revolution to get us out. We had been held up in the Tehran Hilton for three or four days after arriving in a bus convoy from Isfahan 280 miles south of Tehran. US and Canadian Embassies coordinated evacuation flights from the Tehran Hilton while the Islamic Guard provided ‘security.’ Word was that the Communist Youth Movement that helped Khomeini to power realized they were being betrayed and were attempting to attack the Tehran Hilton. A lot of windows had been shot out on the lower floors of the hotel and machine gun positions were placed around the hotel. Most members of the Islamic Guard had been street cleaners or taxi drivers before the revolution. They lacked discipline or any understanding of how to handle firearms. As a result, they were more of a safety hazard than security. It wasn’t until we arrived at the Tehran airport that we saw any real disciplined military. These paramilitary forces, however, wore distinctive black and white keffiyeh and must have been Shia PLO because Hezbollah did not exist until 1985. Perhaps more significant than the black and white keffiyeh were their prominent Arab noses. By the time we boarded the Pan Am flight, we had been searched dozens of times. Even when seated on the plane, paramilitary with AK-47s in black & white keffiyeh walked up and down the aisles for one last passport check. The barrel of an AK47 caught my cheek as one of them passed by. I froze. Fearing any movement might provoke violence, I endured the gouging. Five minutes later, we were in the air. A loud cheer reverberated throughout the cabin and the crew broke out the booze. Alexandria Ocasio-Cortez has become the lightning rod of conservative talk shows after introducing a Green New Deal resolution to Congress. The concept is not new. Thomas Freidman coined the idea of a Green New Deal in his book, Hot, Flat, and Crowded in 2007 and British economist Richard Murphy founded the Green New Deal Group the same year. Yet, Ms. Ocasio-Cortez’s resolution has been met with overwhelming skepticism and mockery from the right. The plan must decarbonize the economy. The young people who will have to live with the effects of climate change want a plan that begins with what is necessary rather than what is deemed politically possible. The plan must include a jobs guarantee by the federal government and large-scale public investments. Again, the GND is not just climate policy. It’s about transforming the economy, lifting the up the poor and middle class, and creating a more muscular, active public sector. Addressing the issue of climate change is being championed by a fifteen year old Swedish climate activist, Greta Thunberg who addressed delegates at the UN sponsored COP24. WE NEED TO LISTEN AND LEARN FROM OUR YOUTH. 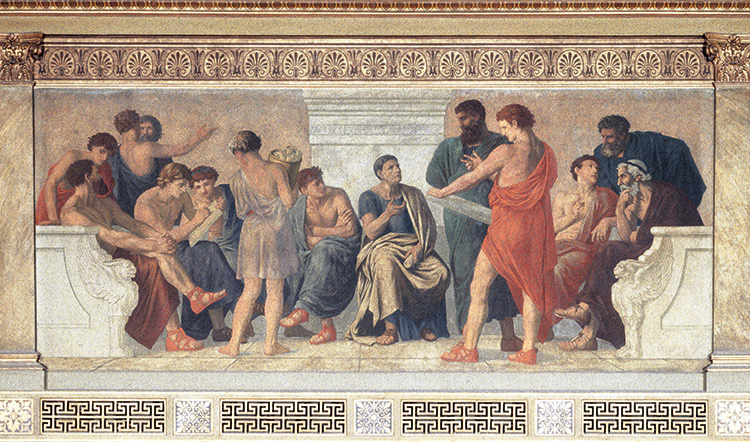 logos (λόγος) – the use of reasoning, either inductive or deductive, to construct an argument. pathos (πάθος) – the use of emotional appeals to alter the audience’s judgment through metaphor, amplification, storytelling, or presenting the topic in a way that evokes strong emotions in the audience. 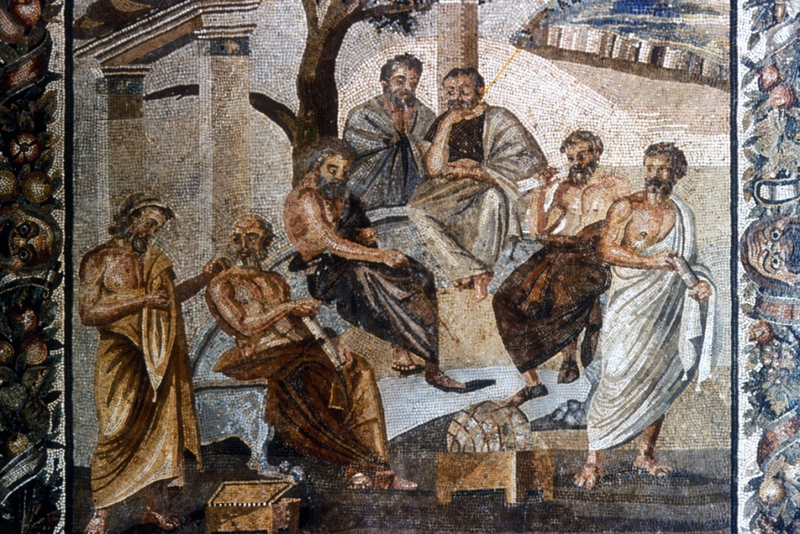 ethos (ἦθος) – Aristotle’s theory of character and how the character and credibility of a speaker can influence an audience to consider him/her to be believable— there being three qualities that contribute to a credible ethos: perceived intelligence, virtuous character, and goodwill. 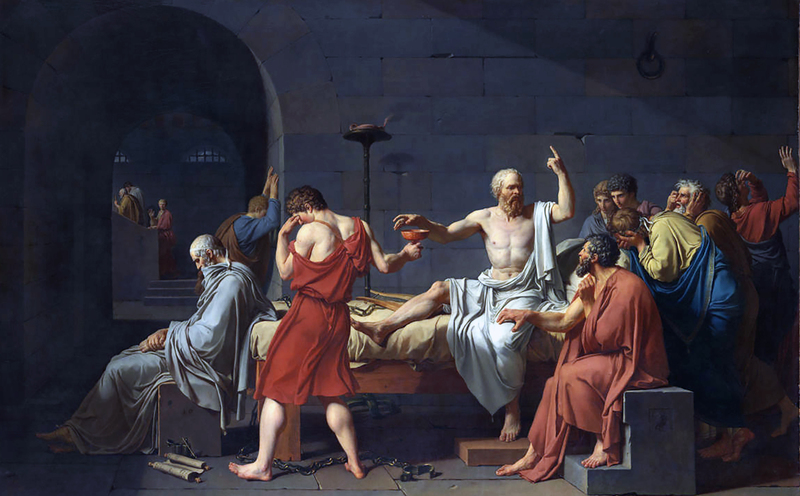 Throughout history, rhetoric has been taught and studied as the basis of communication and its principles shape how writing is taught in universities throughout the world.